Among the things the Lord hates, as King Solomon tells us in Proverbs 6:16-18, is “a heart that deviseth wicked plots.” And a new lawsuit filed by mortgage megalender Fannie Mae against several major US and foreign banks for illicit acts involving international LIBOR rates points up the fact that the “wicked plots” hatched by these institutions have a global reach. The nine banks involved include perennial American mortgage fraud bad guys Bank of America, JP Morgan Chase and Citigroup, as well as foreign institutions including Credit Suisse, Deutsche Bank AG and the Royal Bank of Scotland. Fannie Mae is alleging that it suffered losses relating to its mortgage transactions as a result of these institutions’ tweaking of their LIBOR rate numbers. LIBOR – the London Interbank Offered Rate – is the highest profile of several benchmark rates that help institutions worldwide set interest rates for borrowing from each other. Each day, 150 LIBOR rates are posted by participating banks and other kinds of financial institutions, and those rates affect the offered interest rates on loans such as mortgages and business financing on a global scale. LIBOR rates serve as benchmarks for domestic and international interest rates on everything from home mortgage loans to business and consumer loans for products, facilities and services. False numbers can skew the rates in favor of a particular institution’s lending practices, to the detriment of other entities relying on those rates. This isn’t the first time an American megabank has been sued over LIBOR manipulation. Bank of America was the target of another suit filed over the same issue by the Justice Department in 2012. 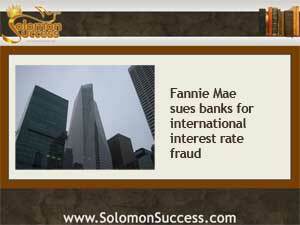 And Fannie Mae’s smaller cousin, Freddie Mac, filed its own suit against more than a dozen banks in March 2013. Although the world of international finance may seem distant from the average consumer, anyone who takes out a loan can be afect4ed by LIBOR rates. And with a majority of US home loans originating with fully or partially government –backed agencies including the FHA, Fannie and Freddie. false rate reporting can create losses in revenues and damage the reputation of these entities. And the problems can then be passed to secondary loan servicers who handle financing on a local scale. There’s no clear end in sight for legal actions against the nation’s biggest banks. And as evidence for malfeasance mounts not only on the domestic but also the international stage, more lawsuits any be coming. JP Morgan Chase, for example, is facing another round of suits for its involvement in energy shares overseas.